Bonnie Shepherd cared for her husband who suffered from FTD until he passed away in 2011. 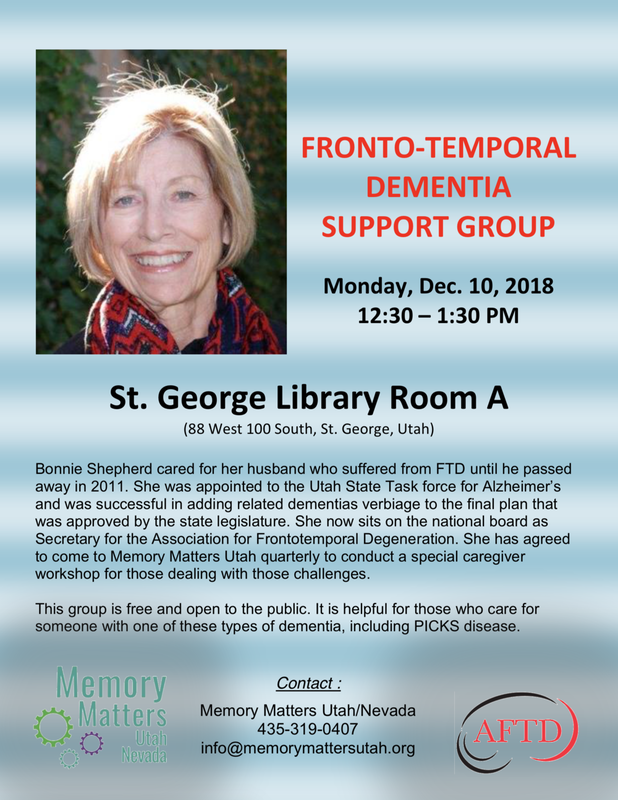 She was appointed to the Utah State Taskforce for Alzheimer’s and was successful in adding related dementias verbiage to the final plan that was approved by the state legislature. She now sits on the national board as Secretary for the Association for Frontotemporal Degeneration. She has agreed to come to Memory Matters Utah quarterly to conduct a special caregiver workshop for those dealing with those challenges. This group is free and open to the public. It is helpful for those who care for someone with one of these types of dementia, including PICKS disease.